Looking for easy ways to save money on groceries? We have them. These tips will help you be successful when grocery shopping on a budget. Here are 10 easy ways to save money on groceries. Reducing what you spend on groceries can make a HUGE impact on your budget. Saving money on groceries doesn’t have to be difficult. Here are some easy ways to save BIG on your groceries in under an hour a week. You realistically can save 50% off your groceries by following these easy money-saving tips. Don’t worry it isn’t just cutting coupons so you can save money on fresh healthy food too! 1. Sensibly Stockpile – When items are on sale buy enough to last for about a month. (unless perishable) This enables you to never pay full price. This is a change in mindset for more people but you will see a HUGE impact on your grocery bill with this small change in shopping habits. This tip works especially well for meats. You can freeze your sale priced meat and use it for meals throughout the month and you won’t have to buy any at full price! Meats not on sale can cost $3 or more a pound than sale meats. 2. Easily Find Weekly Sale Prices and Coupons That Will Save Even More – Check out the weekly sales flyer online or use the Favado Smart Phone App to help you find coupons and determine which items are on sale this week at the grocery store. The app will even alert you went your favorites are on sale and you can search across grocery stores for the best price on items you need. Items marked with a star are the best deals on the week. 3. Meal Plan Around Items in Your Stockpile and What is on Sale. Did you find a great price on chicken? Be sure to plan some chicken meals. Did you get 5 boxes of almost free pasta last week? You will need to plan some meals with pasta. This strategy is especially true for produce since you can not stockpile because of spoiling. Be sure to look at produce on sale and use this in your meal plan. Another great positive of a meal plan is that you will be sure to use the groceries you buy and not let them go to waste. Meal planning is one of the easiest ways to save money on groceries plus save on the stress of coming up with dinner ideas each day! 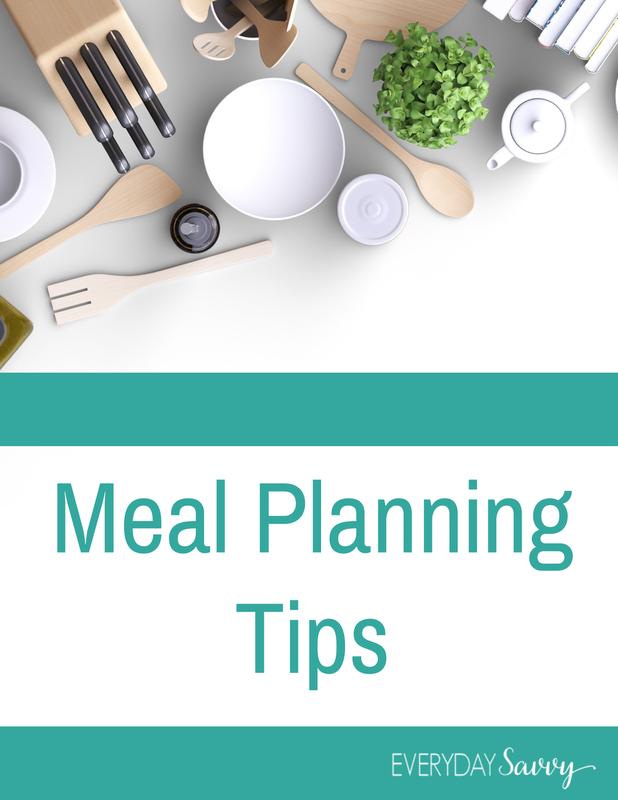 Have trouble with meal planning? Sign up to get easy tips sent right to your inbox. 4. Use Less Meat & Other Higher Priced Ingredients – Consider a few meals in a week without meat. This will save you money. Also, when you have meals with meat consider proper portions sizes. It will help your meat go farther. When I buy large boneless skinless chicken breast, I cut it into thirds and each person gets just a one-third portion. 5. Shop at Value Grocery Stores like Aldi – Aldi has great everyday prices on basics like milk, eggs, and spices. They also have great produce specials each week. Here are some of the reasons I love to shop at Aldi and you should too. 6. Limit Brand Loyalty – Name-brand items tend to be more expensive unless you have a great coupon. Be sure to consider house brands and other name brands. These are usually placed on lower or higher shelves. So be sure to look up and down when grocery shopping. The most expensive items are right at eye level. 7. Check Unit Price – Most people think that if they buy the larger item that they are getting a better deal. This is often not the case. Be sure to always check the unit price when shopping. 8. Avoid Buying Prepared and Packaged Goods – You are almost always going to pay more when the store does the work for you. Wash and cut your own veggies and you can save. 9. Search Grocery Coupon Database – Wondering if one of the products you need has a coupon? Use our grocery coupon database to check for coupons for all the items on your list. It includes food coupons and printable manufacturer coupons. Spending just a few minutes using the database to search for coupon can help a bunch. Be sure to bookmark the grocery coupon database and check it each time before shop. You can search for a brand name or just a general item like cereal or mustard. 10. Use Smart Phone Apps and Digital coupons – You can save even more by using smart phone apps and digital coupons. Two of my favorites are Shopkick and Ibotta. You also can get digital coupons for your favorite store. Locally, Kroger has digital coupons and Meijer offers the Mperks program. I also love to save at Target with Cartwheel and text coupons. The most important thing to remember when using all these tips is to Make a Plan and Stick to It! Use these easy ways to save money on groceries and you will be shocked how much money you can save. Grocery stores use all kind of marketing tricks to try and get you to spend more. Be sure to do your research and check the grocery coupon database to get your coupons. Love the Favado app. I definitely need to check out the others that you mention. When we’re having meat or cooking with meat, I do that too with portions. It’s amazing how far you can stretch just 1 chicken breast. :) And I so agree with you about cutting up your own veggies. I almost feel like it’s healthier to do your own too. These are great tips, Melissa! Glad you enjoyed the post! Saving money at the grocery store doesn’t have to be hard. I love when people realize that just by changing a little bit about the way they shop and meal plan that they can save big money! If you pound out chicken portions with a mallet, it looks like more and it will cook faster too. Good tip! I do this too and it sure helps make your meat go farther. These are great tips! Checking the sale flyers before I plan the menu for the week is a great way to spend less for our family. I also love Checkout 51 app. These are all fantastic tips, but I would add a warning about shopping from your stockpile. A lot of people buy mostly their pricier ingredients in bulk (meat, cheese, etc) to get a good deal and stick it in the freezer. It’s a smart move, but if you then center your meals around your stockpiled items…you could be automatically meal planning around your most expensive stuff, instead of starting with lentils or something that you don’t stockpile because they’re so cheap anyway. That is a good tip. When meal planning is is always important to look at the price of ingredients. Adding shredded carrots to ground beef or turkey when making meatballs, meatloaf, or burgers will extend your meat further and you can make more servings out of it. It’s also a great way to sneak in extra veggies! That is a great tip! Thanks so much for sharing it. Great budget tips. I’m always looking for ways to save. Tricky with picky pre-teens but doable. I hope to be better at planning out meals in advance. That will definitely help save on wasting food. Great advice! I totally agree with checking the unit price. With a good sale, several smaller packages can be cheaper than a large package. And, I’ve realized so many times that a warehouse-sized box is not always a good deal. These are great tips! I love stockpiling when items are at rock-bottom prices. Thanks for sharing at Merry Monday! There’s a huge bakery that supplies all kinds of breads, bagels, tortillas, etc to all the big grocery stores. In addition they have several discount stores around our region, including one where the bakery is located. Luckily not too far from me. When the trucks pick up close to being staledated products they bring them back to their head office location and sell them in the discount shop for less than a third of the cost at the grocery stores. They might be a day or two from expiring, but I can stock up my freezer with 10 loaves of premium multi grain loaves, bags of bagels, and if I’m lucky they’ll have garlic bread. All for less than $20 and it’ll last a couple of months or so. That is a great way to stretch your grocery budget!